Napoleon > Who was Napoleon? Napoleone Buonaparte was born in Ajaccio, Corsica, on 15 August 1769. He was the second of eight children born to Carlo Buonaparte, a lawyer descended from Tuscan nobility, and his young wife Maria-Letizia Ramolino. At the time of Napoleon’s birth, Corsica had been ceded to the French by the Genoese. Carlo joined the Corsican independence movement, led by Pasquale Paoli, but when Paoli was forced to flee, Carlo accepted French rule and gained a position as an assessor for the judicial district of Ajaccio. With the support of the French Governor of Corsica, Josef Marbeuf, the Buonapartes were able to successfully lobby for inclusion in the list of French nobility, making their sons eligible for scholarships in France. Napoleon left family life in Corsica and along with his older brother Joseph began his education in the French system. He was to attend three schools: Autun (where he spent three months and learnt sufficient French to enter military college), the military college at Brienne (where he studied for five years) and the military academy of Paris. Napoleon entered Brienne at the age of nine. French military colleges in Napoleon’s time were elitist institutions filled almost exclusively with native French nobility. Conditions at Brienne were spartan and as a slight, young, impoverished Corsican on a scholarship, Napoleon suffered from discrimination at the hands of his fellow students. He excelled, however, at maths, geography and history, reading extensively on the great leaders of the past, and was said to have enjoyed the plot of garden that each cadet was given to maintain. Successful examinations gained him entry to the military academy of Paris where he chose to specialise in artillery. The military academy was a school for the most privileged elite. Students enjoyed five-course meals and elegant classrooms – conditions far different to those Napoleon had earlier endured. In 1785, when Napoleon was not yet sixteen, his father died of stomach cancer. His older brother Joseph left his studies and returned home to assume the position of the head of the family. 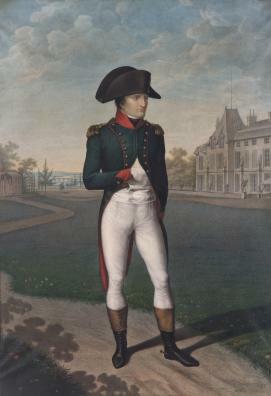 In September of the same year, Napoleon graduated from military college, ranked forty-second of fifty-eight, but completing the two-year course in half time. Although eager to pursue a career in the navy, Napoleon was deemed too young and was instead made a Second Lieutenant in the Royal Artillery. In the ensuing years Napoleon returned frequently to his native Corsica. In 1791 he won a senior position in the Corsican National Guard. When Paoli aligned himself with the English and succeeded in ousting the French Revolutionary government in Corsica, the Buonapartes relocated to France, changing their name to the more French Bonaparte. Napoleon came to the attention of the National Convention for his part in quelling counter-revolutionary outbreaks in Toulon. When, in October 1795, royalists rebelled against the new government proposed by the National Convention – the Directory – Napoleon was again called on to put down the rebellion. Napoleon turned cannons on to the crowd and halted the uprising. His growing favour earned him the command of the Army of Italy. On 9 March 1796 Napoleon married Marie-Josèphe Rose de Tascher de la Pagerie (whom Napoleon called Josephine), a thirty-two-year-old widow from Martinique who had two children from her first marriage. Two days later, he left to command the French Army in Italy. His successful campaigns were to bring him further acclaim. Next, Napoleon’s aspirations turned to the east. Assembling an army and a phalanx of scientists he devised a plan to block English trade-lines to India by conquering Ottoman-ruled Egypt, while simultaneously uncovering the secrets of the ancient world and cementing France’s reputation as a nation of learning and enlightenment. Despite rapid success initially, the French fleet was destroyed by the British in the Battle of the Nile and the French were eventually forced to withdraw. Napoleon made his way back to Paris in 1799, leaving the French forces to battle on until 1801. He returned to find France challenged by a new alliance between Austria, Russia and Britain and the Directory under siege. Leading a coup that placed himself firmly in power, he became the first – and most powerful – of three consuls, ending the Directory. As First Consul, Napoleon led France to the first period of peace that she had enjoyed in ten years with the Treaty of Amiens, signed in March 1802 between Britain, France, Spain and the Batavian Republic (the Netherlands). Peace was to last little more than a year but during this time visitors flowed between London and Paris. In 1802 the French people approved an amendment to the constitution to make Napoleon First Consul for life. In 1804 the senate and people voted him Emperor. Napoleon crowned himself in a ceremony in Notre Dame cathedral, also crowning Josephine Empress. Napoleon served as Emperor from 1804 until 1814. During the ten years of his reign, he acquired control of a large proportion of Europe, establishing his family members in positions of power: brother Joseph was King of Naples and later King of Spain; brother Louis was King of Holland; Jerome was King of Westphalia ( a region of North West Germany); sister Caroline Bonaparte was married to Joachim Murat, who became King of Naples after Joseph left for Spain; sister Elisa married the Prince of Lucca and was made Grand Duchess of Tuscany; and sister Pauline Bonaparte married Prince Camillo Borghese, a Roman noble. 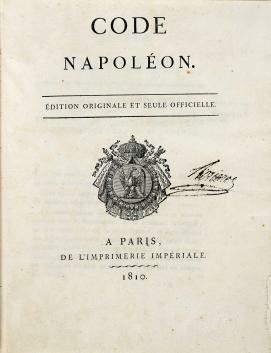 Napoleon worked furiously to implement a uniform system of government and laws for all French domains and territories in the Code Napoléon. The Code established guidelines for civil procedures, commercial law, the penal code and criminal procedures, removing the injustices of the feudal system. 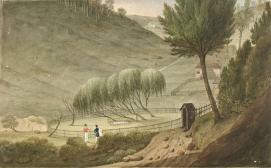 Napoleon formalised a state education system and established a state bank. He set the stage for a unified Itally and established a vision for a unified Europe. Meanwhile, he also worked to further France’s power through a series of wars and alliances. Josephine, unable to provide an heir for Napoleon, agreed to a divorce in 1809. In 1810, Napoleon married eighteen-year-old Marie-Louise of Austria, the grand niece of Marie-Antoinette. She gave Napoleon his longed-for son, Napoleon Francis Joseph Charles Bonaparte (20 March 1811– 22 July 1832), known also as the King of Rome. In 1814 an alliance of British, Austrian, Prussian and Russian forces overcame those of Napoleon and occupied Paris. Napoleon was forced to abdicate and to go into exile. He was given rule over the island of Elba, off the Italian coast. In France, Louis XVIII had been restored to power. After several months on the island Napoleon escaped, returning to Paris with the popular support of the army. This new reign was not to last. After what became known as the One Hundred Days, Napoleon’s forces were defeated at the Battle of Waterloo and Napoleon abdicated yet again. Seeking asylum in England, he was instead exiled to the isolated island of Saint Helena in the Southern Atlantic, west of Africa. Napoleon Bonaparte lived for six years on the island under the watchful eye of the island’s British Governor, Sir Hudson Lowe. Here he was to write his memoirs and reflect on the events of his life. He died on 5 May 1821 and was buried on the island. His last words were ‘France, the Army, the Head of the Army, Josephine’. Napoleon’s body was returned to France and in 1840 was interred in Les Invalides along with the bodies of his brothers and son. Create a timeline of key events that led to Napoleon’s rise to power. Analyse how these events contributed to his rapid promotions. Do you believe that Napoleon would have acquired so much power if the events of the French Revolution had not occurred? Why? Why not? Napoleon described himself as an heir of the Revolution, often using slogans of the cause to support his policies and programs. Was Napoleon’s Empire underpinned by the ideals of liberty, equality and democracy? Explain. The Civil Code 1804, implemented by Napoleon, is considered one of his many great achievements as ruler of France. Investigate the influence this code had throughout Europe.